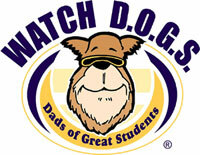 Dare's Watch D.O.G.S. mid-year event will be held on Wednesday, February 7, 2018 from 6:00-7:00 pm in the DES Cafeteria. We welcome Dads and their children to learn how Dads can help and make a difference at Dare. The Dare PTA will provide snacks and hosting a paper airplane contest. Join us for fun and prizes! If you have any questions - please contact Sabrina Brown (jbrown192@cox.net).